I was 16 (going on 17) when I watched my first Test match live from the ground, at least where my memory undoubtedly serves me right. I have the sketchiest of memories of going for a match at the M.A Chidambaram Stadium sometime in the ‘80s, but I was too young and the least bothered to remember the opposition. I was told it was most probably Australia and in later years I took guilty pleasure in boasting that I was at the great Tied Test of 1986. But there never will be any conclusive evidence of my actual ‘debut’ as a spectator, as this was long before the era of the Internet, Facebook statuses, check-ins, Foursquare, and the like. 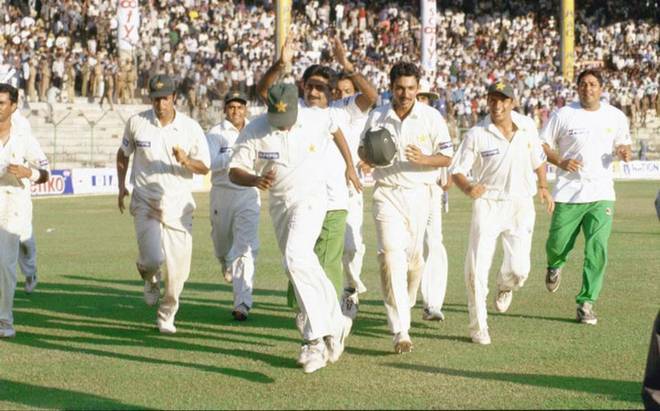 Still, the India-Pakistan Chennai Test of 1999 was certainly not a bad game to get a first taste of live Test action through — particularly the fourth and, as it turned out, final day. Only that I didn’t know I was going to be in attendance until that morning. It was the last day of January, a Sunday. By a stroke of luck, my mother’s colleague had a spare pass so we dashed down to his apartment in Alwarpet to pick it up before heading to the stadium. The seat was too good to pass up — terrace stand with a great view from behind the deep cover region. With unprecedented security measures in place, it was going to take a while to enter. I had read in the preceding days of fans being turned away because they wore black clothing or anything remotely remonstrative. Mercifully, dark glasses were permitted. It was a politically charged atmosphere, certain parties determined to sabotage the cricket in protest against the neighboring country. Beset by threats ranging from pitch vandalism to cobras being set upon unsuspecting fans, the security personnel were leaving nothing to chance. Play had begun by the time I reached my gate at Bells Road after having walked nearly the entire length of Wallajah Road. The air was vibrating with the din from the stadium as I passed the Triplicane junction. Then the intense frisking began. All I had on me were my wallet, shades and cap — outside-food and water-bottles were a strict no-no. Fans were all but strip-searched at various points. After what seemed like an eternity, I made it up the stairs to my seat. Only a straight view would have properly captured the peach from Wasim Akram that claimed Rahul Dravid. The ball pitched outside leg stump, swerved left, dodged Dravid’s pads and outside edge and shaved the off stump. It took a few seconds to register that the off bail had fallen. In the ensuing pall of silence in the stands, you could hear the celebratory whoops from Waz and gang. Saqlain Mushtaq bowled non-stop from one end, where I was seated, while Akram and Waqar Younis ran in from the other. The offie, who took 5 for 94 in the first innings, was captain Akram’s trump card. It was difficult to tell from where I was sitting whether Mohammad Azaharuddin was indeed plumb in front when he padded up to Saqlain. But the finger went up immediately and it was now 73 for 4. Later, though, what needed no more than one replay for confirmation was the wrongfulness of Sourav Ganguly’s dismissal. Even to the naked eye situated several metres away, the ball had clearly bounced after it rebounded off silly point before landing in wicketkeeper Moin Khan’s gloves. One cannot fault the Pakistan players for appealing, for any team would have done the same, but it was nothing but a pure umpiring howler. At 82 for 5, lunch couldn’t have tasted too good for most home fans. But the safety net that was Tendulkar kept them from throwing in the towel. What many of us didn’t know was that his back was already killing him, and that Nayan Mongia was battling temperature. There’s something wacky about players wearing sweaters during humid Chennai Tests. Only Greg Matthews can explain the idiosyncrasy of wearing one in the 1986 game (let’s not even get started on his ‘circus clown on steroids’ antics at the boundary). Mongia had no choice as he and Tendulkar dug in to ensure that India remained unscathed between lunch and tea. Two rows ahead of me were a group of four guys who looked like college students. As the mood perked up through the session and the next, so did their raucousness, which prompted a couple of cops to step in and politely gesture to them to pipe down. Word had spread and a television cameraman showed up to capture this mini party. When Moin botched an easy stumping with Tendulkar one big hit away from a century, our hearts skipped a beat. Tendulkar was simply destined to win this, or so we thought. Standing up to cheer his century would be the defining memory of the match, or so we thought. Saqlain was suddenly not as effective with the second new ball, and Tendulkar figured that the only way was to attack, before his back collapsed on him. Respect for Mongia the batsman shot up and though he couldn’t stay till the end, he did enough to cover the slack for the men before him. Then Tendulkar perished to a skier, and the collective feeling from the Chennai crowd was “No, way, this can’t be happening!” Akram, in a documentary on this series, is seen telling his players at the huddle that anything was possible if you captured the head of the snake. He fittingly figured in the first three dismissals post tea. When Sunil Joshi spooned a catch back to Saqlain with India still 15 runs away, the boisterous guys in front were too numb to shout; everyone felt like under-trials at the dock struggling to digest a guilty verdict. When Javagal Srinath played on to Saqlain, the delirious Pakistan players went down on their knees for thesajda. For Indian fans, Pakistan had completed a heist in full view of the ubiquitous cops. For the thousands who remained, the music had died. I can’t explain how the ovation happened in that blur. Were we as Indians ashamed forwhat we did three years earlier at Eden Gardens? Had that semifinal passed on without incident, would Pakistan have still got the rousing ovation that they did? Maybe it was just the realisation that we were extras in an unscripted thriller. I can’t remember where it began, but when the players began their lap of honour, within seconds it went viral and the whole stadium was on its feet. In the 20 years since, over many conversations and articles, I’ve come across more and more people who witnessed this game from various stands. In Chennai, being the small world that it is, this isn’t terribly surprising. Most of these conversations happily digress from the actual match to a nostalgia trip on the geography of the stadium. Maybe Chepauk has that effect on you. The stadium today has a different look to what it was then, but some of the old still remains. Over several visits to the stadium since, my eyes go to roughly the exact spot from where I watched this classic. Even if I didn’t actually mark my attendance at that Tied Test, I can safely say that those present there on January 31, 1999, were part of history.